What has your experience been like as a parent in the YWCA Minneapolis Early Childhood Education program? As a first-time mother, it was hard for me to find a place where I felt comfortable knowing my baby was safe. Both my husband and I work full-time, and we need help during the day while we work. I tried home daycare and was not satisfied with the level of care and education my son was receiving. The comfort and security I get knowing my children are well taken care of and are learning every day is wonderful even though it’s expensive for our family. 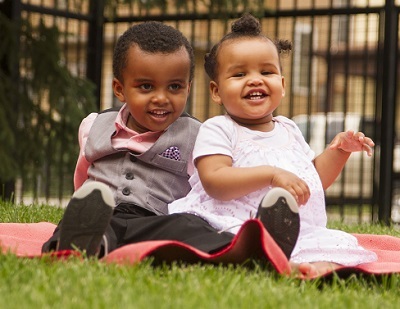 My son and daughter are both enrolled in the YWCA Minneapolis Children’s Center at Abbott Northwestern. My son started when he was eight months old; he turned three years old in March. My daughter is one year old. She started at three months old. I work at Abbott Northwestern Hospital in the Nutrition Call Center. Being able to easily drop off my children without having to go multiple places is a wonderful thing. They are so close that I feel like I’m here with them. I sacrifice my lunch to go to the Children’s Center and spend time with my children. If my daughter is sleeping, I stop back at my 3:45 pm break. I’m very happy with the care my children are receiving. There is nothing I can compare to knowing that my children are in a safe place. Why do you choose to bring your children to the YWCA Minneapolis Children’s Center at Abbott Northwestern when you have other options for daycare? Education is the #1 priority for my husband and me as immigrants. Education really drives me and is the main focus for my children. When I checked online for daycares, having a strong focus on early childhood education was important to me. YWCA Minneapolis provides both a safe place for my children and a strong focus on education. Even as a parent who loves my children unconditionally, I can’t provide all of the early education that is so critical for my children. I love and nurture my children, I read to my children and spend time with them, but I can’t give all of the attention that my children’s teachers can give them. YWCA Minneapolis has the structure and curriculum to make sure my children are learning and meeting their developmental milestones. At two years old, my son was like a little adult. He could sit at the table and use a cup early. This is wonderful and makes me so proud! I want my children to have a better life than me. My husband and I are from Ethiopia. 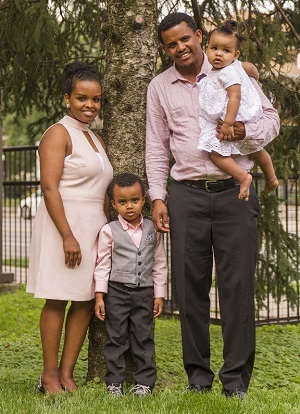 We moved to the United States to provide a better life for our family. I want my children to be successful in life for their family, for their community and for their country. Even though I’m an immigrant here, I call Minnesota my home. I want my children to have that too, a sense of community. What would you like to say about your children’s teachers? How are my children doing today? How are they eating today? What are they learning today? Are they getting enough sleep at nap time? The teachers are very patient and helpful, and always take the time to answer all of my questions. What do you think your children would say is their favorite part of the ECE program? My son looks forward to the swimming lessons at Midtown, doing art projects, seeing his teachers and playing with his friends. I’m very grateful to have my children in this program.